We’re all getting older, but we don’t have to accept letting go of our youthful looks. There are a range of treatment options—from photofacials and chemical peels to acne treatments—designed to give your skin a smoother, clearer and more youthful appearance, all based on effective, fast, non-surgical methods. For those of you with moles or skin tags, we offer the very best treatments available for these difficult conditions. When performed by our Ageless Living specialists, BOTOX® Cosmetic injections can be one of the simplest and most effective ways to take years off your appearance. With a few injections in areas that could use improvement, wrinkles can be significantly diminished giving a refreshed and natural appearance. Although Botox treatments are available in many places, Ageless Living has the experience to make them count and help ensure that you don’t have a negative result. Have you always wanted fuller lips, a shapelier nose, or a more contoured cheek? With Ageless Living, you can look as good on the outside, as you feel on the inside. Using Juvéderm® facial fillers we can help you to uncover the ideal contour for your face, or to give you the luscious lips that you’ve always wanted. Filler is a versatile and safe treatment—even used for non-surgical nose jobs and earlobe reshaping. Talk to an Ageless Living Specialist to find your perfect treatment. Our selection of advanced treatments include some of the most most effective techniques for tightening, smoothing and lifting skin as well as reducing scarring, red and brown spots. Using radio-frequency, microneedling and PRP technology we can penetrate to deep layers of the skin and stimulate the production of collagen in your face, improving skin elasticity. Treatment times vary but noticeable improvements to your skin will be the result. We applaud you- you’ve undertaken an incredible task in losing weight and creating a healthier, better you. But sometimes, even after all that work you’re left with unsightly areas of your body or face where you would like to see some further contouring. Imagine the results of further defining your jawline or having tighter skin without surgery or the months of recovery. BodyFX, Fractora Firm and Belkyra are all advanced techniques that get you the results you want–from reducing cellulite to getting rid of your double chin to general tightening of the skin. Treatment times vary but some could be done in as little as 20-30 minutes- you could be a new you on your lunch break. Want even greater results? Visit us to talk about a series of treatments which we can recommend. Hair. We’ve all got it, but sometimes it’s in the worst possible places or results in uncomfortable and irritating razor burn. We can use Intense Pulsed Light therapy and lasers to gradually remove unwanted facial or body hair for both men and women, with all types of skin. The process is far quicker, less painful and more permanent than shaving or waxing. Spider veins and reticular veins—even the names sound a little off-putting. Your legs help you climb the ladder of success, they are the body parts that truly keep you moving and they should look good too. At Ageless Living Cold Lake, we use non-surgical leg vein treatments to help diminish the appearance of unattractive leg veins while getting you back on your feet in the time it takes to make supper! Plus, we have the ability and specialized equipment to perform ultrasounds of the deep vascular system prior to treatment so that we can create a tailored and appropriate treatment plan. The latest commercial for mascara is always just around the corner, and there is always a new name that makes it sound high-tech and like it will give you the perfect lashes. Why waste countless hours or loads of money maintaining eyelash extensions or finding the right mascara when you could have an effective, safe treatment to help you grow fuller, longer and more luxurious natural lashes. Whether you’re a young-at-heart woman or a person suffering from hypotrichosis—Latisse® eyelash prescription could work for you. Do you want to see what Latisse® can do for you? iOS users can find the iLash Studio app in the app store! The delicate skin of your earlobes is easily damaged: it can be torn by accidents with earrings or permanently changed by gauges. A short procedure using only local anesthetic can repair damaged earlobes in twenty minutes per ear, with little or no scarring and no downtime at all- we can even use filler injections to add volume to misshapen earlobes. Once your earlobes are fully healed you are even able to have them pierced again! Men and women can both experience hair thinning as they get older, but it’s much more common in men. 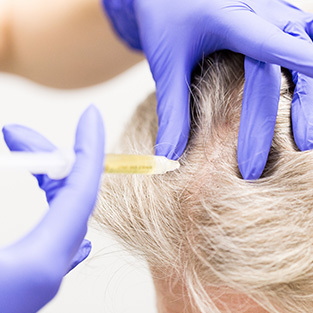 Hair plugs and wigs are expensive and inauthentic, and pills to restore hair can be hit-or-miss, but Platelet-Rich Plasma therapy uses your body’s own natural regenerative abilities to grow real, natural hair with minimal risks.